Entrepreneurs use financial modeling to forecast the performance of a business into the future. This process creates a mathematical model, typically in Excel, to represent a simplified version of a company that is based on historic records and reasonable projections. Without a firm understanding of your financial position—you will need to know how much money (and time) you can spend getting your startup launched before you run out of cash—you can’t plan how to move forward. And a good financial model can help you assess new investments and opportunities, ­­evaluate your successes (and failures), and curb dangerous impulses that could ultimately derail your company. A financial model does not need to detail every single aspect of your business, but it does need to model key assumptions in a way that is useful for planning. While the task of forecasting can sometimes be daunting, you never want to make up numbers out of whole cloth. Instead, you will want to use a combination of financial statements, industry projections, and market research to fill in the blanks. At its most useful, a solid financial model helps you weather extreme outcomes by forecasting them. This allows you as the entrepreneur to handle a range of possibilities, both favorable and undesirable. How Does a Financial Model Help You? The simplest form of a financial model is known as the 3-Statement Model. It provides your business with an income statement, a balance sheet, and a cash flow statement. There are more advanced types of models, such as the discounted cash flow analysis model (DCF), but for most startups and young businesses these are not necessary or even desirable. You need information you can read, understand, and act on in a timely manner. Financial models are usually required when you are raising outside capital, but they can be useful for making internal decisions as well. For example, Company X had an exciting new product for the home cleaning space. They know what their costs would be to produce 10,000 units and the staff they’d need to handle orders—from taking the orders to picking, packing and shipping them. They have a sophisticated marketing program complete with a strong online presence, including celebrity endorsements and a well-known blogger endorsing their product. The company now needs to try to predict the variable costs of getting their new product to market, including estimates of how many units will sell, for what price, and on what timeline—to make sure they have enough capital to stay in business during this growth phase. Plus, the HR person is concerned about future staffing. With just three in-house staff at launch, they know they are going to have to add employees pretty rapidly once the business takes off. Their model helps predict the cost of adding employees, and keeps the principals focused on doing so on a timely basis, but without going over budget. Modeling can provide information on many different scenarios. By changing the variables, such as price per unit, cost of delivery, and estimated gross profit, you can readily predict which changes will most impact your bottom line. One of the best things about financial modeling is that it’s always a work in progress. As time goes by and your business conditions change, you’ll need to plug in new numbers to see what comes out, so that your decision making is up to date. If you are ready to make a model, but don’t know where to begin–don’t worry! While you can take an Excel class (or a full Business Modeling class), the truth is that this is an area where hiring a seasoned professional ad hoc to support your efforts can be very helpful. 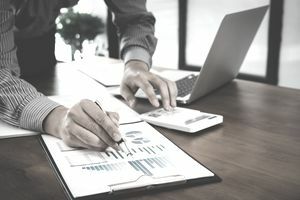 Business school graduates are likely candidates to help you make a useful model, but there are lots of professionals who regularly build and analyze financial models, including investment bankers, accountants, and operation managers. A site like Upwork can help you find an experienced finance person to get your model going, and local business bureaus and business centers can give you access to freelance and volunteer resources that can be very helpful. If you decide to go it alone, download a template as a starting place—especially one that matches your type of business. This will give you a head start, but don’t be bound by what is or is not included. In addition to having good data and good research, good Excel practices can make a huge difference in how useful your model will become in helping you manage your business as it grows. Use blue fonts for hard-coded inputs and black ones for variable formulas. Items you are still researching can remain in red until you feel more confident about them. The more dependencies and layers you have in formulae, the more likely they are to break down. Keeping things simple and breaking complex calculations down into small steps can save you lots of aggravation in the long run. You don’t need to be an Excel master, but understanding how numbers and formulae flow in Excel can make your projections much more useful. Use the CHOOSE function to build scenarios, and use INDEX and MATCH instead of VLOOKUP to query data. The best models are easy to understand by those who are not intimately familiar with your business. Make sure to label things well and to group data logically. You may find sharing your model to be a necessary strategy to expanding your business. The saying “a picture says a thousand words” is particularly relevant with regard to complex statistical analysis. Make yourself a Dashboard that provides “at a glance” updates of the most important aspects of your business, and check regularly that it is producing good clear information you can act on. Once you have completed your model, make sure you test, test, and test again! You will need to test different scenarios to see how the model performs, and make sure that your Excel formulas are accurate. In short, your financial model is only as good as the numbers you use. And when the process is up to date, not only can it help you see your business for what it is today, but it can also help you predict the future, and position you to plan accordingly.